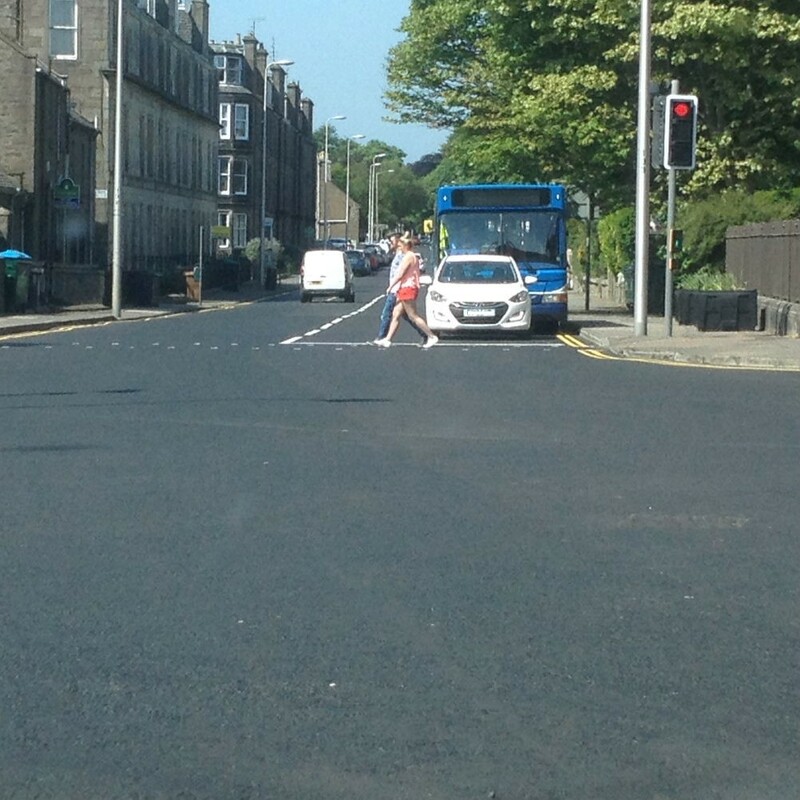 “The road marking has been reviewed and compared with the original layout. The lining will require to be altered here to provide formal right turn and straight ahead as per existing pre works set up. At this moment in time there is no “Right Turn or Straight Ahead” arrow. (It has been) … identified that cars were operating the historical two lanes without the formal arrows however, we will check the lane width to ensure this is sufficient and if alterations are required these will also be made. The reason behind this not being marked as previously is in relation to reviewing the level of detail issued for each job by the Roads Maintenance Partnership. The level of lining information was not as we have provided in the past, this obviously has not been a success and we will review the process to ensure lining details are provided to meet individual scheme needs in future. Back in October, I queried at the City Council’s City Development Committee the proposed possible siting of an electric vehicle charging point on Perth Road, west of Shepherd’s Loan, at the Sinderins junction – see right. Yesterday, along with a representative of West End Community Council, I met with the council’s Head of Transportation and the Sustainable Transport Team Leader on-site to discuss this. Although the principle of providing public electric vehicle charging points is a good one, my concern about this possible site was sight lines for vehicles emerging from Pinegrove. I am pleased to say the City Council is not proceeding with this site. We took a walk down Perth Road and into South Tay Street to look at other proposed sites, all of which appear to be fine. There will also be parking spots for car club vehicles. These initiatives are being done in such a way as to minimise any loss of general-use car parking. Sinderins – thank you Bonnie Dundee! 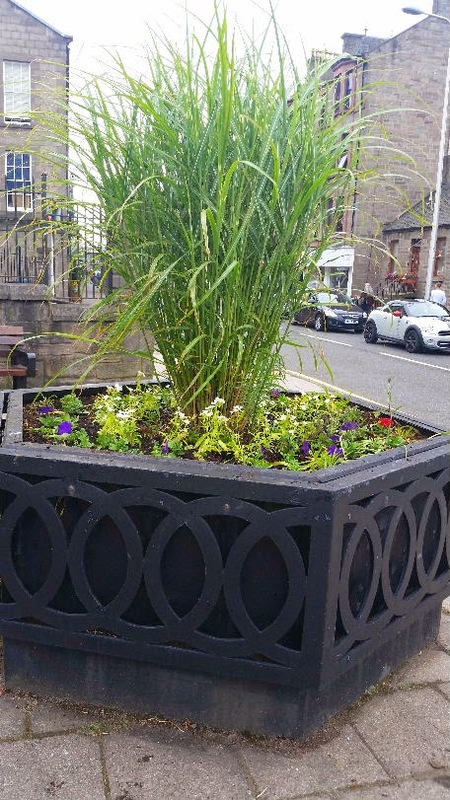 In advance of Beautiful Scotland judging on 8th August, Bonnie Dundee has made a lovely job of the planters at Sinderins! Spring in the West End! 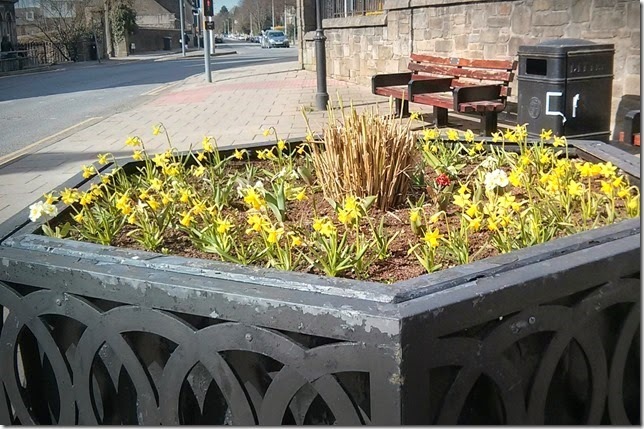 Many thanks go to Dr Ann Prescott for the photo below of the daffodils the Bonnie Dundee group has planted at Sinderins – and they have also planted white primroses in front of Blackness Library! “I have become increasingly conscious of a potential danger at the foot of Blackness Avenue. There seems to be a great increase in traffic flow at this junction. Traffic going east from Perth Road into Hawkhill can take so long that the lights change to red forcing traffic turning from Hawkhill into Blackness Avenue to do so on the red light. 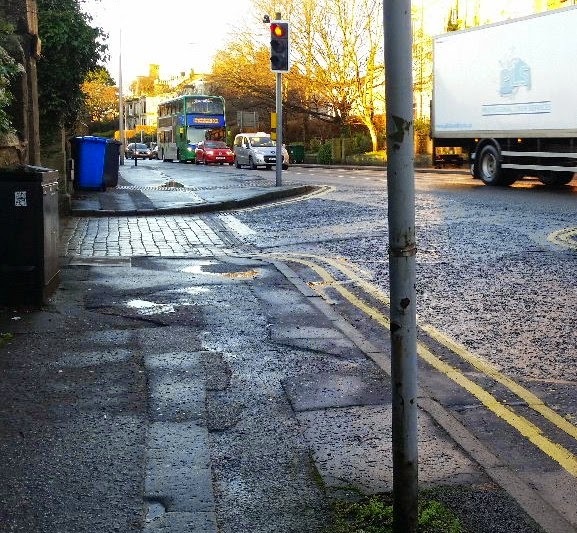 “I have had my staff in Urban Traffic Control (UTC) to have a look at the Sinderins junction and the signal settings relating to the right turn from Hawkhill into Blackness Avenue. The traffic signals allows a significant amount of time for vehicles to make the right turn movement up Blackness Avenue after the main road signal turn red. Once vehicles have passed the stopline they are allowed to turn right on a red light as the intergreen periods are set up to allow them to do so safely and clear the junction. It is possible to install a right turn indicative arrow however this will require a re-analysis of the junction performance and it could be detrimental to overall junction capacity. In the last three and a bit years there has been two slight injury accidents at this location, one involved a pedestrian who was under the influence of alcohol the other one was a rear end shunt and did not involve vehicles turning right up Blackness Avenue. 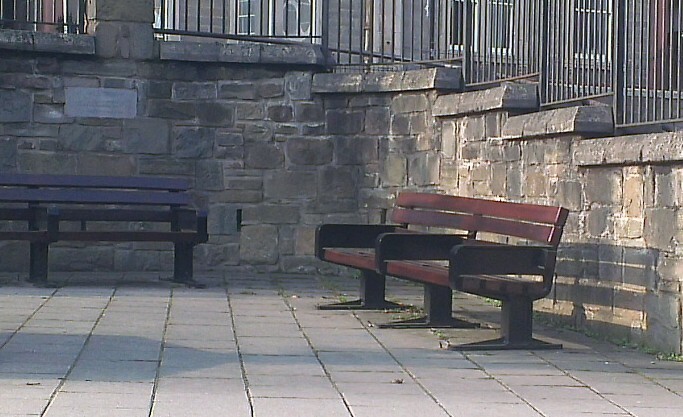 Some weeks ago, I asked Community Payback if the rather dilapidated seating at the Sinderins junction could be restored. Yesterday, I received constituent concerns about the length of lights sequence at the Sinderins junction. The concern was that whilst vehicles sitting in Hawkhill going west into Perth Road have a long period of “green” and many vehicles get through on green, vehicles heading the same direction but leaving from Perth Road (shopping area) to continue along Perth Road get an inadequate time with only 4-5 cars getting through on green. The result was build ups along Perth Road eastwards into the shopping area. 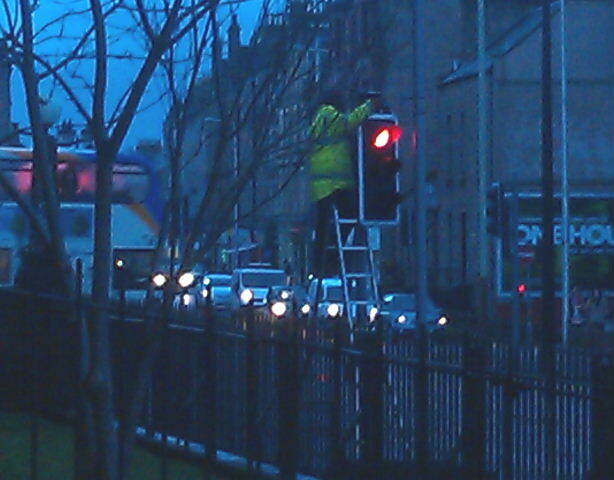 “Thank you for advising of local concerns over the operation of the traffic signals. We are aware of this problem and there is an intermittent detector fault which is affecting the performance of the junction. I was pleased to note late yesterday afternoon that the matter was being attended to on-site by engineers – see photograph (right).